The ideal addition to your home gym or fitness studio, the CAP Olympic bench offers stand-out design and sturdy construction in a single piece of equipment. The rack is the perfect addition to the adjustable bench. Using the bench at different angles encourages multiple muscle engagement, so you can work the muscles you want for a more defined and sculpted physique. Solid in construction and compact in size, the CAP Olympic bench doesn't take up too much space and works hand-in-hand with dumbbells & barbells. Take your floor based exercises up a notch and perform them on the bench so you can work your ABS on a supportive and comfortable platform. 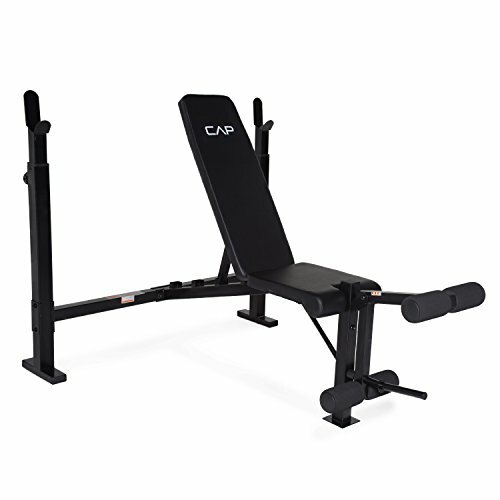 Ideal for users of all levels, beginners or more experienced, the CAP Olympic bench is a must-have tool in any keen fitness enthusiast's arsenal.